I arrived at Hong Kong International Airport’s Terminal 1 at 1630 for my 1750 flight and proceeded to Air New Zealand’s (Air NZ) check-in area in Zone G to collect my boarding pass for the 11-hour NZ80 service to Auckland. There were no queues at the dedicated premium economy counters, but as security was relatively slow that day I did not get airside until 1650. Premium economy passengers are not eligible for lounge access unless they have tier status with Air NZ or Star Alliance. The closest members’ lounge following security and immigration is the newly renovated Singapore Airlines lounge, near gate 15. The flight was called at Gate 31 at 1720. Passengers in business class, premium economy and Star Alliance Gold status holders were given priority. Once in my seat (23K), I was offered a glass of New Zealand sparkling wine and watched the purser go from seat to seat to introduce himself – a nice touch. Air NZ’s newly refurbished B777-200ER is configured for 312 passengers, with 26 fully flat business seats, 40 in premium economy and 264 in economy. Premium economy is a separate cabin, configured 2-4-2, and occupies rows 23 through to 27. The seats, upholstered in sleek black leather, feature a generous 41-inch pitch and are 19 inches in width. Each reclines 9 inches, about 50 per cent more than in economy, and is fitted with a padded leg rest and a foot bar. Entertainment comes via personal 11-inch foldout touchscreen monitors. Premium economy guests receive noise-cancelling headphones and large, good-quality pillows (both of which are provided in business class). As an improvement, I would suggest thicker blankets, as well as retractable dividers between seats to create more “personal space”. The seat, when fully reclined, offered a decent amount of comfort on this overnight flight; the leg rest definitely helped. Though unable to sleep, I thought the seat was very comfortable indeed for working on my laptop, and managed six hours of uninterrupted writing before turning to the in-flight entertainment for the remainder of the flight. The on-demand selection comprised a wide array of recent blockbusters, Asian cinema and TV programmes, all available in multiple languages. I loved the fact that you could compile a list of favourites and have it emailed to you after the flight, so that you’ll never again forget the title of “that movie you saw on the plane”. I would choose any pair in bulkhead row 23 as it provides ample extra legroom, allowing you to get in and out of your seat without disturbing your neighbour. However, Air NZ typically charges an extra fee, in this case HK$500 (US$64), for these. The other seats are all acceptable, but window seats A and K give the feeling of a higher degree of privacy. We took off at 1815 and hot towels were handed out once we were airborne. A round of drinks was offered about 20 minutes into the flight, followed by dinner. There was a tasty gravlax salmon appetiser with wasabi mayonnaise, honeydew and watermelon salsa, accompanied by warm garlic bread and rye or sun-dried tomato rolls. For mains, there were three choices: red wine braised beef; Chinese-style sweet and sour sole; or roast chicken breast with chorizo crushed potatoes, peperonata and rocket. I had the beef, which was a lovely stew with mushrooms, pumpkin, spinach and artichokes topped with crispy shallots – delicious. To finish, the omnipresent and consistently professional crew served a light and fluffy dark chocolate mousse cake with cocoa and vanilla cream. Air NZ offers a premium selection of award-winning New Zealand wines on board. I was particularly impressed with the 2011 Hawke’s Bay Crossroads, a full-bodied Cabernet Merlot with silky tannins that persist into a long, elegant finish. A large and tasty breakfast comprising fruits, assorted cereals, yogurt, warm bakery goods and a choice of three hot items from the stove was served about 90 minutes before landing. We got into Auckland’s Aotearoa International Airport at 0930, 20 minutes ahead of schedule, and disembarked via an airbridge. There were no queues at immigration and customs. Priority luggage came out first after a five-minute wait at the belt. 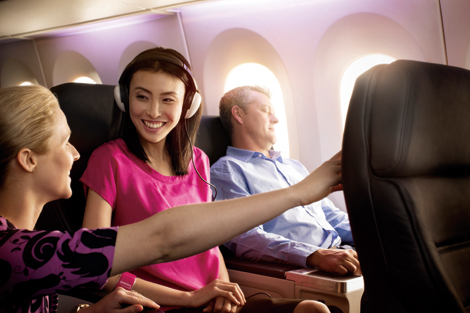 Air NZ’s refurbished premium economy product remains one of the best in the segment. While contemporary and stylish in design, the seat is conducive to getting a good amount of rest, or work, when flying long haul. The superb selection of food, wine and amenities was impressive and reminiscent of regional business class travel. The service was outstanding: personalised, refreshingly light-hearted and efficient. PRICE Internet rates for a semi-flexible mid-week Hong Kong-Auckland premium economy return flight in May start at HK$16,830 (US$2,170) including taxes and surcharges.